A stunning ocean view condo walking distance to the beach in the desirable Canto Del Mar development is now available! This incredible stand-alone villa is one of the best, with front-row ocean views, a private location at the end of the road, and easy access from the coastal highway. Known as Villa HighPalms, this spacious 3-bedroom unit is the largest one currently for sale in the entire complex, and best of all, there’s plenty of room to add a pool. If you’re looking for a vacation rental, a retirement investment, or a place to call home, this Costa Rica ocean view condo is perfect for you. Canto Del Mar is a gated community of 35 condos just south of Dominical on the southern Pacific coast of Costa Rica. The condos in Canto Del Mar are all stand-alone villas spread over a hillside with views of Dominicalito beach below. Villa HighPalms is located in the first row of condos in Canto Del Mar, so it enjoys unobstructed whitewater views without looking over the rooftops of other condos. This is one of the best views in the development. Additionally, Villa HighPalms is at the end of the road, so it is very private. It is nestled in the jungle canopy, providing lovely shade and opportunities for viewing wildlife without obstructing the incredible view. Villa HighPalms is one of the best condos in Canto Del Mar, and for only $375,000, it could be yours! If you’ve dreamed of relocating to Costa Rica, retiring here, or simply making an investment in an incredible place, this is the condo for you. Watch the waves crash on Dominicalito beach and enjoy visits from monkeys, toucans and sloths from the comfort of your jungle terrace. Walk to the beach to surf, SUP, or relax and read a book. Or just sit back and watch the income roll in from vacation rentals. 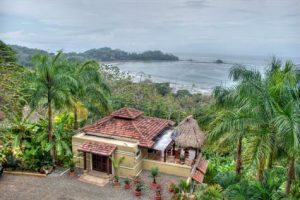 Whatever you do, don’t miss this opportunity to own Villa HighPalms, an incredible ocean view condo in Costa Rica.